Assalamu alaikum (peace be with you)! MashaAllah (by God’s grace) almost a year since I began it, today I finished a painting that is rather special to me. After days and days of carefully controlled hours with not much free time, finally today it was a day of nothing scheduled to do and therefore the luxury of being able to paint. This piece is special because I began it at a time I needed to be reminded that God indeed is in control of everything. It was a time when much I had built my hopes on was falling apart around me, a lot of it due to my own wrong doing or that my own best efforts were not enough. I felt like a bird, adrift over an angry sea, trying to keep my wings held high and keep going without the waves washing over me, trying to ride the storm. The name I was reminded of during my time of difficulty is ‘ar-Razzaq’ meaning ‘The Provider’ or ‘The Sustainer’. We say all provision is from Allah. Indeed it is true, for we cannot create energy. All that we need and we take is already made. The source is the One. And on the less metaphysical but more everyday sense, we say every animal and tree has it’s provision assigned by God. Same for us, whatever we need, has been assigned. There is a beautiful article on this majestic name here. Do read it, It is much more descriptive than I can manage. So the painting is about that. That for every bird out there in the ocean, each albatross on its solitary journey for miles and miles and months and months, ar-Razzaq, The Provider, is watching over and will sustain and nourish as needed. 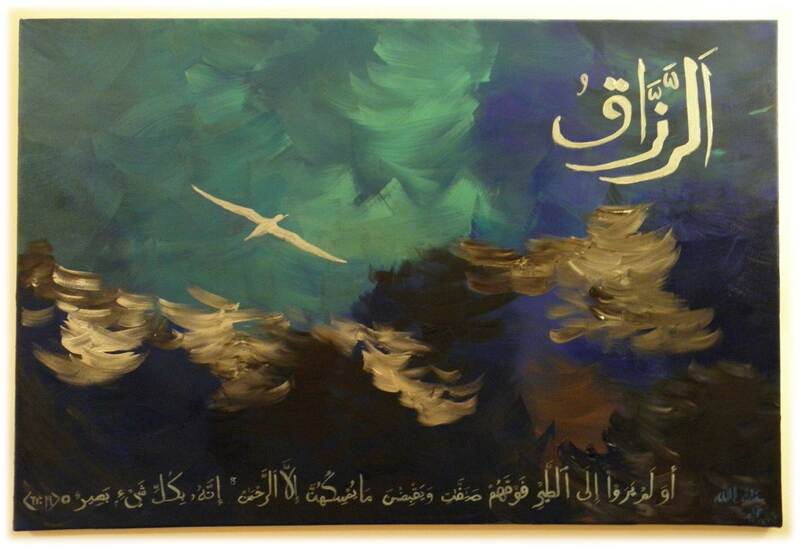 This reminded me of a beautiful ayah (verse) in the Quran, which mashaAllah I put at the end of the painting. It is ayah 19 of one chapter 67. A chapter that is considered to have many healing properties in its recitation. I will end with a link of a version of the recitation of the 99 names so you can listen to what it sounds like. And to end as always, to acknowledge that any good in me is from God and God alone.